An important sewing technique for outdoor clothing is the ability to make a flatseam. A flatseam is one where the edges of the fabric meet but don't overlap, extremely good for underwear, mid-layers, gloves, hats etc. 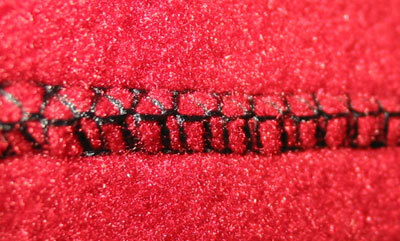 In industry a special machine is used to make this flatseam, whereas a serger makes only normal serged seams. These machines are available for home but are rather expensive. 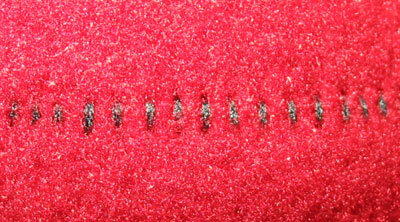 This tutorial shows how to make a flatseam using any normal 3 or 4 thread serger. The flatseam technique uses only 1 needle, and the idea is to make a 3-4 mm wide seam, depending on the serger you would use the left or right needle. A thick, stretchy thread called wooly nylon is used for the best effect, although normal thread can be used. 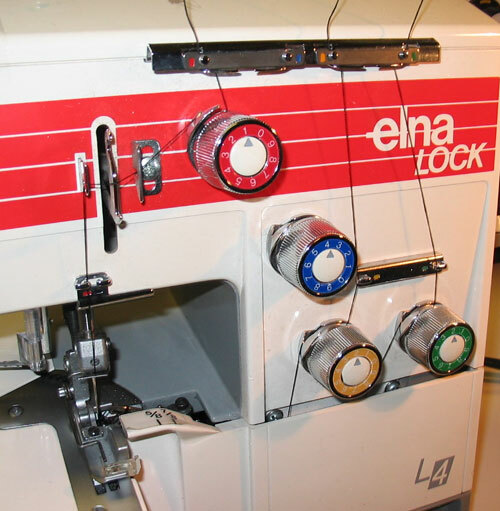 Thread tensions are set very lightly, on the machine shown below the needle thread is on 1/9 and the overlock tension to 1.8/9. The pieces are sewn wrong sides together, opposite to a normal seam. After serging the seam is then forced open with the fingers to produce a very flat seam. Experiment on the fabric used to get the best effect - different thicknesses need tension adjustments. Test and adjust thread tension. Place the pieces wrong sides together. Serge, starting carefully as it tends to bunch at the start. Working along the seam, push the seam open with your fingers from the right side. 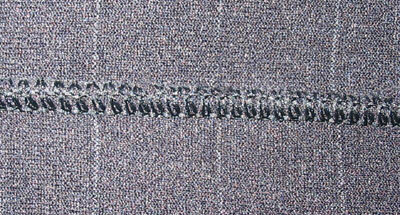 Holes in the seam can be repaired by zigzagging with a normal machine over the seam. The pictures below show a finished seam just after serging, 3 examples of seams from the right side, and 2 examples from the wrong side (notice it is very flat). Flat seam just after serging.